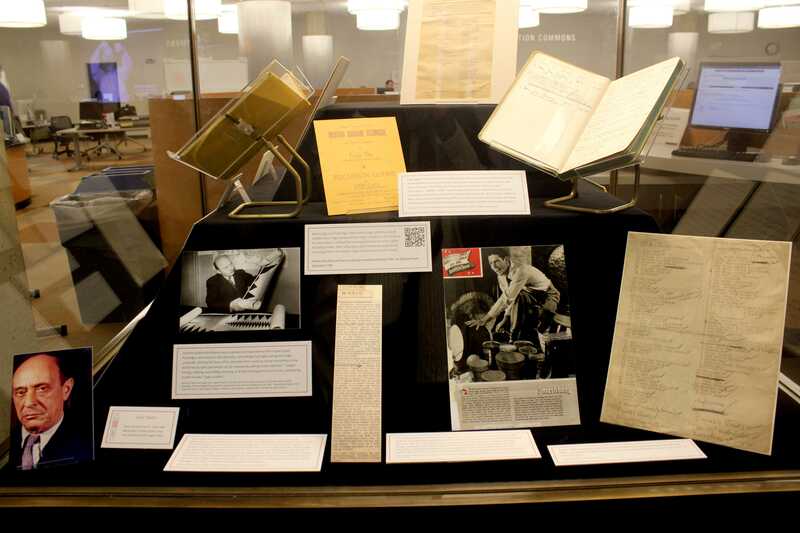 John Cage’s original compositions are displayed in an exhibit at University Library. Featured along with his sheet music are old letters and notes that Cage both sent and received throughout his lifetime. When avant-garde composer John Cage decided to donate some of his musical scores, he recalled his time in Chicago and the commitment to music he saw during his visits to Northwestern. Now, in celebration of Cage’s 100th birthday, those scores and collections are on display in University Library throughout Fall Quarter. Cage’s personal items and compositions, which he donated to NU in the 1970s, make up “Sound and Silence,” a multimedia exhibit highlighting Cage’s life and work. Co-curated by the Music Library’s assistant head Greg MacAyeal and the library’s communications specialist Nina Barrett, “Sound and Silence” features letters, music scores, photos and audio and video accounts from NU faculty who worked with Cage. “Through this exhibit, I hope that students learn about this man, this huge composer, this philosopher, artist and musician, and understand Cage’s impact and the concept behind his music,” said MacAyeal. Cage’s relationship with Chicago began in 1941. He taught classes at the Chicago School of Design and worked as an accompanist and composer at the University of Chicago. During that time, he also produced “The City Wears a Slouch Hat,” a radio soundtrack for the Columbia Broadcasting System, and visited the NU campus multiple times. Hoping to secure more important commissions, Cage left Chicago for New York in 1942. However, he later recalled NU’s commitment to music and personally contacted NU to donate his music scores and almost all of the items featured in this quarter’s exhibit. The collection includes the “I Ching,” an ancient Chinese book of divinations that Cage used for inspiration. “The exhibit is organized around the idea of how John Cage came to be John Cage,” MacAyeal said. The opening of the exhibit Sept. 5 included a performance of one of Cage’s most notable compositions, “4’33”.” About 40 NU faculty members and students participated in a staging of the piece by bringing their own instruments, which ranged from bamboo plants to accordians, and sat still with their instruments for 4 minutes and 33 seconds. The exhibit, with a mix of music, art and other items, aims to explore both Cage as a person and the message behind his music, MacAyeal said. Weinberg freshman Paige Ourada said she knew of Cage from her experience in her high school orchestra, when her orchestra director sent her the music for “4’33”.” She said Cage’s unique avant-garde style distinguished him from other composers. Sound and Silence will be on display in University Library through Dec. 21.